Gaither senior righty Roy Peguero came in to stop a Hillsborough rally and ended up earning the win on the mound as the Cowboys pulled away in a district win on the road. 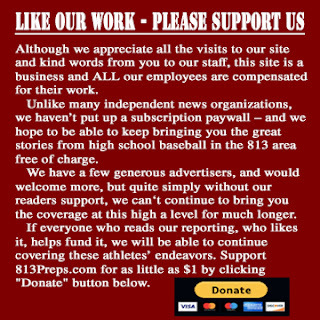 TAMPA – Gaither looked like it was poised to wrap things up early Thursday night jumping out to a six-run lead in the fourth, but Hillsborough made it a bit of a challenge tying the game and forcing the Cowboys to dig deep. Though at one point head coach Nelson North tried to bury his helmet in the third base box in frustration, the Cowboys kept producing at the plate and Gaither came away with a 13-7 win, remaining undefeated in Class 7A-District 8 play this season. 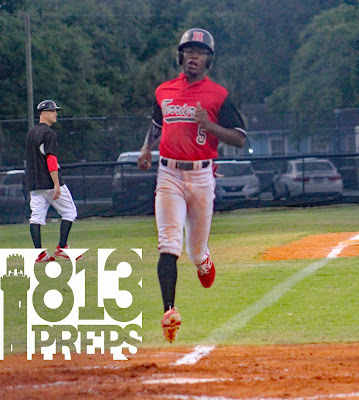 Gaither (9-4, 5-0 in 7A-8) stretched out to the big lead in the third with three runs highlighted by a Willie Jackson double, and furthered the spread with four runs in the next frame with RBI singles from Carlos Chicon and CJ Hanson. But the Terriers came storming back in the home fourth with six runs on four hits, led by a two-run single from Dwayne House, and run producing hits by Juan Jaime-Nunez and Carlos Romero. 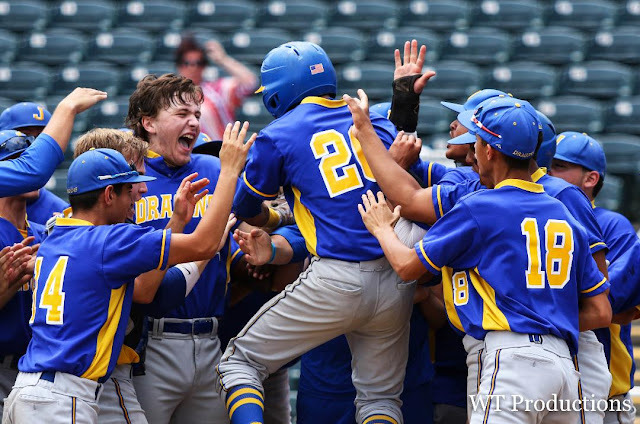 The Hillsborough (4-9, 1-4 in 7A-8) rally though came to a screeching halt though as Cowboys’ sophomore catcher Jacob Choe fired a ball down to third base to catch a Terriers runner trying to steal third. A costly mistake with a pair of runners aboard. 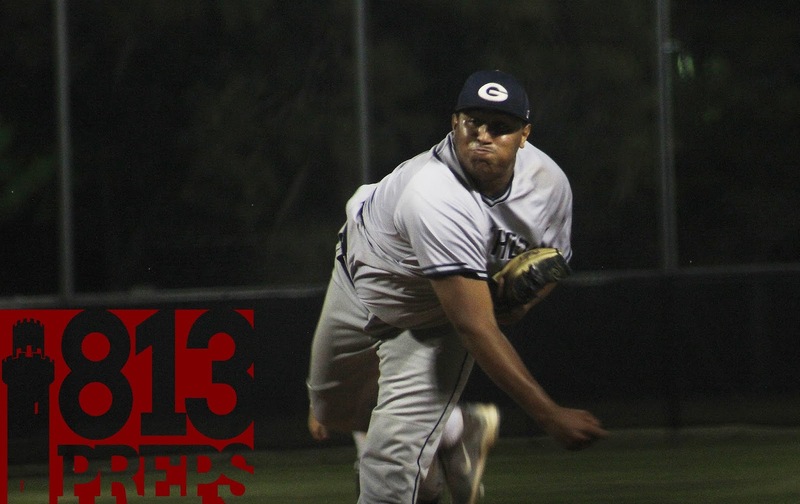 From there it was a new ballgame and Gaither’s big righty Roy Peguero, who was called on to stem the tide in the ugly fourth, worked two more shutout innings on the hill. The 6-foot-7 senior struck out four in 2 2/3 innings of work and is now 3-1 on the season. In response, the Cowboys made an ugly fifth from Hillsborough including two errors, two wild pitches and two walks hurt, pushing the game out of reach with a four-run inning led by an RBI ground ball by Chicon (2-for-4, two runs, two RBI). Gaither salted away the win the next inning adding two more as Sebastian Greico and Frank Perez (3-for-3, three runs scored) each singled and scored in the sixth. Terriers senior Terence Doston scored twice in the loss. Ben Vazquez worked around a two-out walk to finishing things on the mound for the Cowboys striking out a pair in his inning of work. Terence Doston scored a pair of runs for the Terriers in defeat and junior Ian Gunderson allowed one walk, but struck out two in his lone inning on the mound.